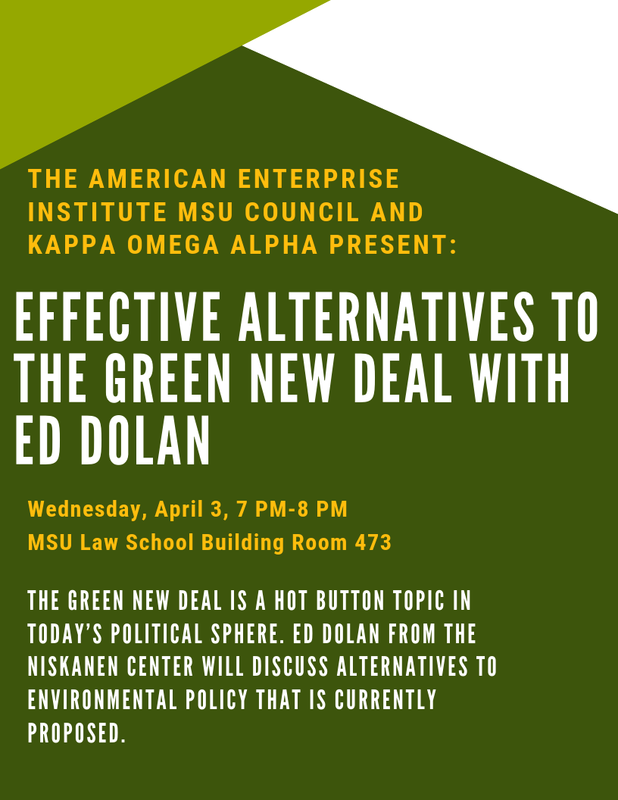 Then, on March 27, Majority Leader Sen. Mitch McConnell forced an actual floor vote on the Green New Deal. It did not attract a single "yes" vote. Nearly all Democrats, including all six co-sponsors of the bill, voted "Present." Republicans and a handful of red-state Democrats voted "No." The carbon tax is by nature regressive, because it will raise the prices of gasoline, electricity, and other goods by the same dollar amount for all consumers, regardless of their incomes. This disproportionately affects the poor, because energy costs are a bigger portion of their overall budgets. A carbon tax will therefore hurt low-income families and seniors more than it will hurt middle- and upper-class households. It is true, as we will see, that poor households do devote larger shares of their incomes to energy than do those with higher incomes, but there is more to the story than that. If we properly measure the impacts of carbon pricing and look at the full range of policy alternatives, there is no reason why concern for the poor should block policies to protect the environment. The population is divided into five income quintiles, from lowest to highest. The blue bars show how many kilograms of carbon each quintile emits per dollar of income; this proportion is much higher for the lowest quintile than the highest, indicating that the poor do spend more of their budgets on energy. But the red diamonds indicate the proportion of national carbon emissions emitted by each quintile, and they move in the opposite direction. In other words, as you move up the income ladder, a smaller portion of your budget goes to energy, but you still emit more. 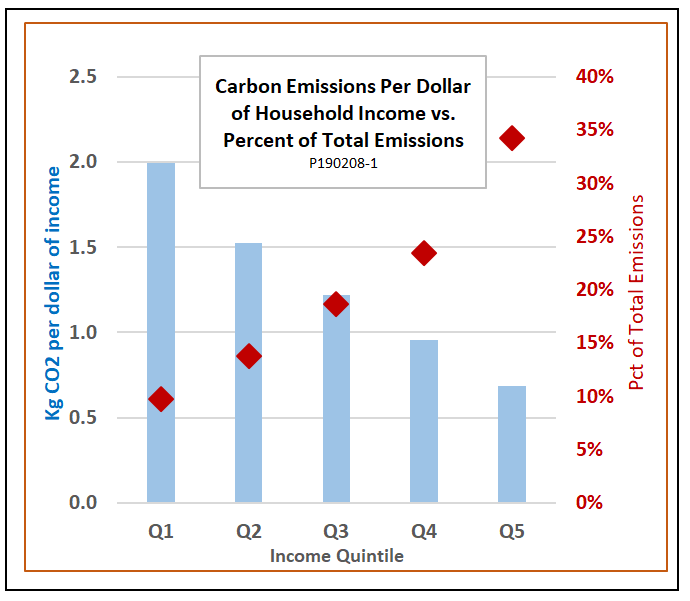 As a result, the top income quintile is responsible for almost 35 percent of total emissions, compared to just under 10 percent for the lowest quintile. Even if we take these numbers at face value, it is clear that forgoing a carbon tax in order to keep energy prices low is an absurdly inefficient way to help the poor. 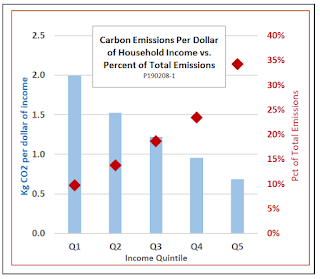 Based on their share of national emissions, the top two income quintiles would capture 58 percent of the benefits of such a policy, compared to just 24 percent for the bottom two quintiles. The very richest households would gain three-and-a-half times more than the very poorest. Furthermore, looking only at incomes and energy use gives a misleading picture of the degree to which the effects of a carbon tax would be concentrated on the poor. 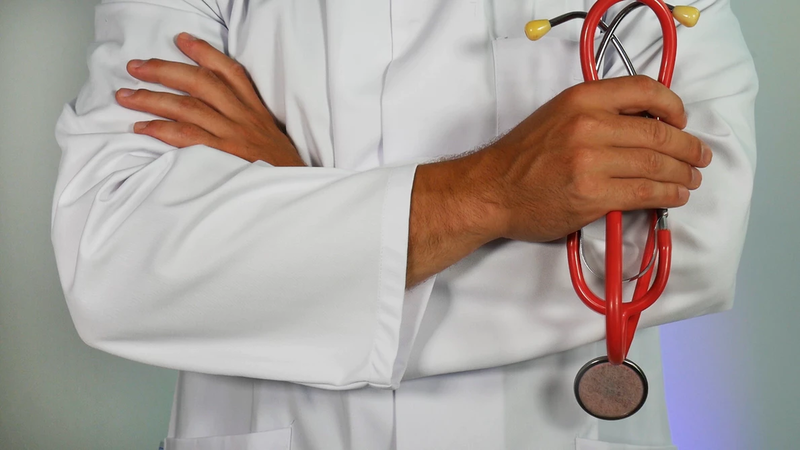 A more recent study by Julie Anne Cronin, Don Fullerton, and Steven E. Sexton took a different approach. Cronin et al. considered not only the direct impact of a carbon tax on household energy prices, but also indirect impacts on the prices of goods like housing, food, and clothing. In addition to income, they also looked at the impact of carbon taxes in proportion to household consumption expenditures, which are more stable from year to year than incomes. They also accounted for the fact that transfer payments to low-income households are indexed to rise automatically when prices increase, whether because of general inflation or due to a policy change like a carbon tax. When all of those factors are considered, Cronin et al. 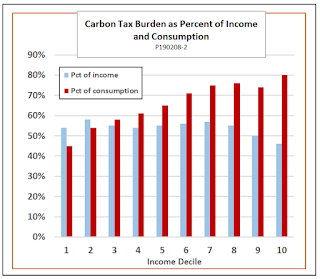 found that the impact of a carbon tax is more equally distributed in proportion to household income and consumption than the conventional wisdom assumes. 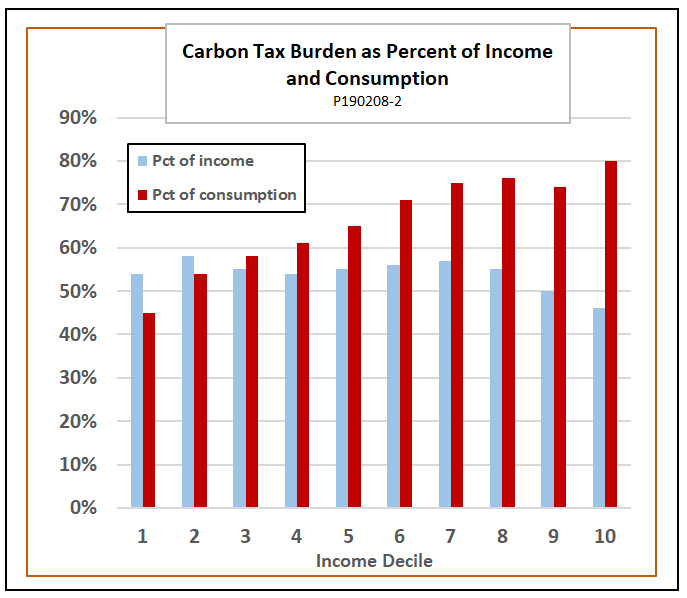 As the next chart shows, the burden of a carbon tax as a percentage of household income varies only slightly, from 0.54 percent of income for the poorest income decile to 0.46 percent of income for the wealthiest decile. If the calculation is done as a percentage of consumption rather than a percentage of income, the impact of a carbon tax on wealthy households is actually proportionally greater than on poor households. If we judge by the Cronin method rather than the earlier Grainger method, the idea of helping the poor by keeping carbon prices low is even more suspect. According to the Cronin data, the top two income quintiles would capture 77 percent of the benefit of forgoing a carbon tax, rather than the 58 percent they would capture based on the older data. Meanwhile, the poorest two income quintiles would receive only 10 percent of the benefit of a low-price policy, rather than the 24 percent they would get based on the older data. Still, though, a carbon tax would have some adverse effect on the poor, even if its impact would not be as regressive as the conventional wisdom suggests. If forgoing a carbon tax is the wrong way to help the poor, what is the right way? The right way to assist low-income families would be to give them extra income to pay the higher prices that a carbon tax would bring. Every serious carbon pricing proposal that I have seen includes some such compensation scheme. For example, the Citizens’ Climate Lobby, one of the leading backers of a carbon tax, proposes distributing the tax revenue equally among the entire population as a “citizen’s dividend.” A group of 45 prominent economists recently wrote an open letter in support of a carbon tax that would take the same approach. Alternatively, some favor a revenue-neutral tax swap that would offset carbon tax revenues by reducing the rates of other taxes. If enough of the rate reductions were focused on payroll taxes or other taxes that are disproportionately burdensome for low-wage households, the net impacts of a revenue-neutral tax swap could be made neutral with respect to income, or even moderately progressive. Still other carbon tax backers propose distributing all or part of the compensation in the form of increased benefits for existing income-support programs, such as food stamps, Social Security, and the earned income tax credit. 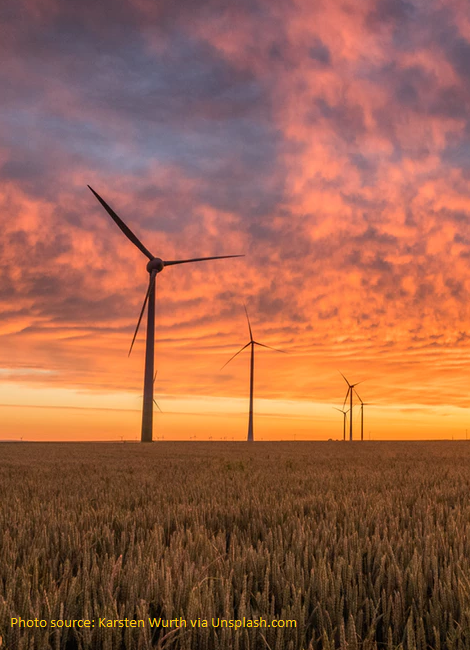 Finally, some backers favor spending carbon tax revenues to address climate change directly, for example, by investing in clean-energy infrastructure or adaptation. If the benefits of slowing climate change are enjoyed equally by everyone, regardless of income, the distributional effects of such a policy would be similar to those of a tax-and-dividend scheme. If, as is sometimes claimed, climate change hurts the poor disproportionately, using carbon tax revenue for climate mitigation would could be even more progressive than a citizens’ dividend. These are not either-or options. Carbon tax revenue could be divided in some way among all of them. In a report for the Brookings Institution, Aparna Mathur and Adele Morris calculate that compensating low-income households for the impact of a carbon tax could take as little as 11 percent of the tax revenues. In an analysis of the 2018 Market Choice Act, researchers from Columbia University and Rice University found that allocating 10 percent of carbon tax revenue to transfers to the lowest 20 percent of income earners increased household wealth and especially benefited younger workers. However, Cronin et al. add a big caveat. They point out that not all families in a given income bracket are equally affected. Those who live in temperate climates use less energy for heating and cooling than do those in more severe climates. People who commute to jobs use more energy than retirees with equal incomes, and so on. The impacts from family to family within an income bracket can vary more than the average effect of the tax across income brackets. The implication is that to be sure that most in the poorest quintile were not hurt, it would be necessary to spend more on compensation than Mathur and Morris’s 11 percent, or to target compensation to regions or activities with high carbon consumption. One final point regarding compensation: The basic point of carbon pricing is to incentivize conservation of energy, investments in low-carbon technology, and other behaviors that reduce emissions. There is a trade-off between compensation and incentives. On the one hand, to make compensation more effective, it makes sense to tailor it to the specific circumstances of beneficiaries, so that fewer are undercompensated or overcompensated. On the other hand, it is important not to allow the compensation plan itself to undermine incentives. For example, low-wage workers who have to drive a long way to their jobs will be more severely impacted by a carbon tax than those who have access to public transportation or can work from home. It would be a mistake, though, to automatically offer extra compensation in proportion to miles driven, or to provide vouchers to allow purchase of gasoline at pretax prices. Any such forms of compensation would remove incentives to move closer to work, use public transportation, or buy a more efficient car. Similarly, fully compensating people who live in hot or cold climates for their extra home heating costs could erode incentives to make their homes more energy efficient or even to move to more temperate areas. 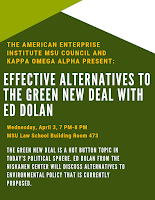 When considerations both of efficiency and fairness are taken into account, “It will hurt the poor” does not ever have to override “It’s good for the environment.” In any democratic political system, there are going to be differences of opinion on the relative priorities of distributional equity and environmental protection, but to say we must abandon one goal to pursue the other is simply false. It is perfectly possible to protect the environment and, at the same time, to protect low-income consumers from any undue effects of doing so. No Democrat is going to win the 2020 presidential nomination without a position on the Green New Deal. At least six of the declared Democratic presidential candidates have endorsed the GND to one degree or another. Some of their endorsements have been notably lacking in specifics. stuck to safe generalities. Climate change is an “existential threat,” she said. “Children need to breathe clean air and drink clean water,” “we have to invest in solar and wind,” she went on. One detail that definitely matters is the role for a carbon tax in the GND package. 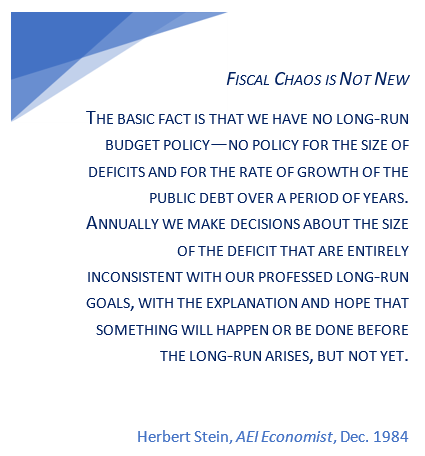 The draft version of the GND resolution currently being circulated in Congress is clearly still a work in progress. Section 4(B) of the draft speaks of "ensuring that the Federal Government takes into account the complete environmental and social costs and impacts of emissions" through "existing laws" and "new policies and programs." That certainly could means a carbon tax. You have probably noticed that the price of gasoline has fallen a little lately. In January, the national average retail price of gasoline in the US fell to $2.20, as low as it's been in 15 years. I filled my car at Costco a few weeks ago for just $1.92 a gallon. But how much does it really cost to fuel your car? Or, as an economist would put it, what is the opportunity cost of buying motor fuel? I would argue that the proper measure of opportunity cost in this case is the number of hours your have to work to buy the gasoline you need to drive your car 100 miles. That turns out to be lower now than it has ever been in the history of the automobile. 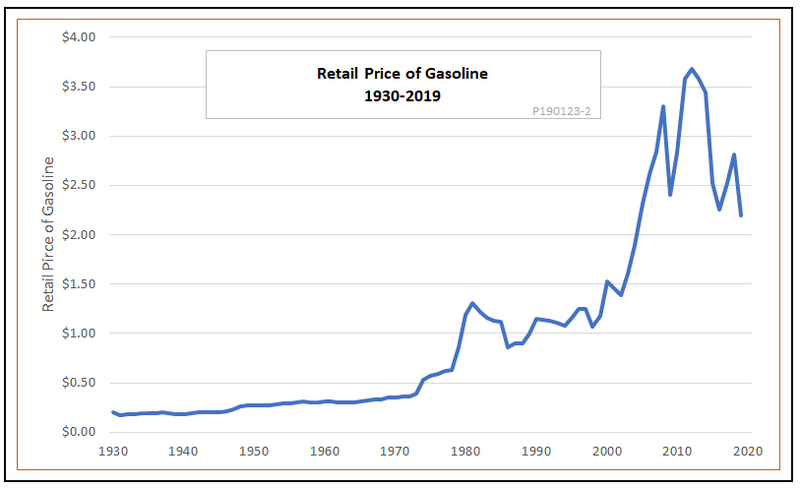 Let's take a little tour through the ages to see just how cheap gasoline is today.